Two files are marked as equal if they have identical content. This variant should be selected when doing consistency checks to see if the files on both sides are bit-wise identical. Naturally, it is the slowest of all comparison variants, so its usefulness for the purpose of synchronization is limited. If used for synchronization, it can serve as a fallback when modification times are not reliable. For example certain mobile phones and legacy FTP servers do not preserve modification times, so the only way to detect different files when the file sizes are the same is by reading their content. Two files are considered equal if they have the same file size. 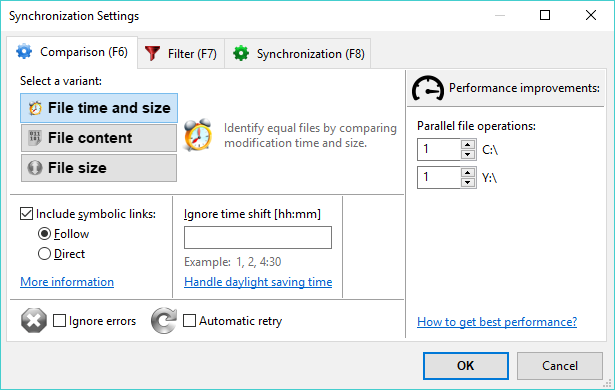 Since it's possible for files that have the same size to have different content, this variant should only be used when file modification times are not available or reliable, e.g. in certain MTP and FTP synchronization scenarios, and where a comparison by content would be too slow. Follow: Treat symbolic links like the object they are pointing to. Links pointing to directories are traversed like ordinary directories and the target of each link is copied during synchronization. Direct: Evaluate the symbolic link object directly. Symbolic links will be shown as separate entities. Links pointing to directories are not traversed and the link object itself is copied during synchronization. Under Windows the symbolic link options apply to symbolic links, volume mount points and NTFS junction points. 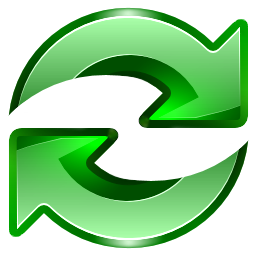 Copying symbolic links requires FreeFileSync to be started with administrator rights.